A lifelong Conservative from northeast Oklahoma, I hold a Bachelor's Degree in Political Science from the University of Louisiana and a Master's Degree in Political Management from the George Washington University. I got involved in politics during college and ended up managing a Congressional campaign before he had even earned his degree. I have extensive governmental experience and have amassed a wealth of both volunteer and professional campaign experience. I am a political consultant, specializing in campaign management, issue research, social media, grassroots efforts, and speech-writing and am a member of The American Association of Political Consultants. The American Political Science Association (APSA) is pleased to announce that Travis N. Taylor, a second year PhD student at the University of Kentucky, has been named as a 2017-2018 APSA Minority Fellowship Program (MFP) Fellow, Spring Cycle. “As a proud citizen of the Cherokee Nation of Oklahoma, I am pleased to accept this Fellow designation from APSA and to represent the Cherokee people in the discipline of political science,” Taylor said. The MFP was established in 1969 to increase the number of under-represented scholars in the political science discipline. Since 1969, the APSA Minority Fellowship has designated more than 500 Fellows, both funded and unfunded, and contributed to the completion of doctoral political science programs for over 100 individuals. Fall fellows are college or university seniors, graduates, or Master’s students who plan on applying to a PhD program in political science. Spring fellows are first and second year PhD students in political science. APSA Minority Fellows are very active in the discipline as faculty members, researchers, and mentors. Visit www.apsanet.org/mfp to learn more about the APSA MFP program and recent fellows. Founded in 1903, the American Political Science Association (APSA) is the leading professional organization for the study of political science and serves more than 13,000 members in more than 80 countries. For additional information on APSA diversity and inclusion programs, please visit us online at http://www.apsanet.org/diversityprograms or emaildiversityprograms@apsanet.org. Travis was recently tapped to serve as a Guest Editor for Ballotpedia: The Encyclopedia of American Politics. Guest Editors, according to the site’s policy, assist the full-time Ballotpedia staff in curating accurate and non-biased information on American politics. Given the website’s tightly controlled standards for content accuracy, formatting, and non-bias, among other standards, Guest Editors are required to pass a written exam and complete an application for review by the Ballotpedia staff. Travis achieved a perfect score on the written exam. To view Travis’ Ballotpedia user page, click here. To learn more about Ballotpedia.org, click here. Travis has been selected as a Fellow in the 2015-2016 Loyola University (New Orleans) Institute of Politics (IOP) program. The program is the premier course for emerging political leaders in the Greater New Orleans area. Every year, the IOP has a competitive slate of applicants, according to IOP’s Executive Director, Tommy Screen. This year’s class was selected from over 60 applicants. Notable IOP alumni include numerous elected officials, including US Senators, Congressmen, and state legislators, as well as popular political observers and journalists. “Over the course of the next few months, I look forward not only to hearing from the lecturers, but also to interacting with and getting to know my peers in the program and working with them in years to come to make New Orleans and the surrounding areas a better place,” Travis concluded. The program runs through mid-March. To learn more about Loyola’s Institute of Politics, visit http://loyno.edu/iop/. In their most recent edition of “Guide: How to Get What You Want Out of Congress,” CQ Roll Call, drawing on the expertise of political practitioners and Capitol Hill staff members, quoted Travis at length. CQ Roll Call is one of the nation’s leading Congressional news and analysis organizations, providing readers with valuable insight into the legislative and political process. Travis was quoted in the Know the Audience section of the Guide, advising constituents involved in grassroots advocacy to contact their own member of Congress, rather than blanketing all 535 Members. Travis’ expertise in the area comes from his time managing the mail program in a Congressional office, an experience that has informed how he advises grassroots advocacy clients as a consultant. The Ultimate Guide to Getting Congress to Listen is available for free download from CQ Roll Call here. In last night’s historic Republican sweep, Travis had a successful night as well. Consulting for 22 races in five states, Travis’ clients won 17 of the 22 while losing only three. Two of his Louisiana campaigns are headed for a December runoff. Innovative Advertising, LLC, where Travis works as a Political Account Coordinator, had an impressive record in yesterday’s election as well. With some of the agency’s races still in flux, the People Who Think appear to have won more than 35 races, while coming up short in only two. Travis specializes in state and local campaigns, and that is reflected in his record from last night. His record in state and local elections last night was 15-1 with one heading to a runoff. State and local campaigns include races for governor, state offices, state legislatures, and more local races such as district attorney and mayoral. Consulting on state and local races also drove Travis’ research on his Master’s Thesis at the Graduate School of Political Management at the George Washington University in DC. His thesis examined the use of nationalization – invoking a national theme – in local elections. “The work for us doesn’t end now, though. We have two runoffs to win in December and a whole year of state elections in 2015,” Travis concluded with a gleeful smirk. On Monday, August 25, 2014, Travis began teaching Political Management at the George Washington University’s Graduate School of Political Management. His role at GW as an online course facilitator will be in addition to his daily functions as a political account coordinator at Innovative. In the new position, Travis is responsible for content delivery, grading, and building student relationships in an online format. He will be leading a class of more than 20 graduate students studying political management. Not only is Travis teaching at the George Washington University, it’s his alma mater. He received his Master’s Degree in Political Management from the program he is now teaching. Professor Herness will be the instructor of record for the course Travis is facilitating. During the semester, which runs for six weeks in the online format, Travis will teach one section of Fundamentals of Political Management, an introductory course to the graduate program. “I’m very excited about this opportunity to help train the next generation of political operatives. They are undoubtedly very driven and professional students, so I’m looking forward to a great semester,” Travis concluded. After more than two years working inside the Beltway, Travis is taking his talents and additional experience back to the Bayou State, where he began his career in politics. Travis, who recently graduated from the Graduate School of Political Management at the George Washington University, has joined the team at Innovative Advertising as a Political Account Coordinator. In this new role, Travis is responsible for assisting with strategy development and works to ensure political projects flow through the agency as smoothly as politics allows. Along with Innovative’s other new hires, Travis joins a dynamic and rapidly growing team. Innovative Advertising is a full-service advertising agency based in Mandeville, Louisiana, about 25 miles north of New Orleans. The agency boasts a wide portfolio of both corporate and political advertising work. The agency was recently named to Inc. Magazine’s list of Fastest Growing Companies. To see more information about Travis’ hiring, see Innovative’s newsletter, Brainwaves. Travis was honored to receive a national Pollie Award at the annual conference of the American Association of Political Consultants in San Diego, California. The ad portrayed a young mother telling the story of her daughter who received free medical treatment from the clinic of Dr. Bill Cassidy, a Louisiana physician running for the U.S. Senate. While the account was fictionalized, the power of the script, visuals, and political acumen were sufficient to earn Travis his third Pollie Award in two years. The Pollie Awards contest is run by the American Association of Political Consultants and staffed by volunteer judges who blindly review submissions. Pollies have been called “the Oscars of political consulting” by Esquire Magazine and are recognized as the industry’s highest honor. Travis, on Friday was awarded two Pollie Awards during the annual conference of the American Association of Political Consultants in Washington, DC. Travis received the political consulting industry’s mark of honor with a Silver Pollie in the category of Best Use of Social Pressure-Republican and a Bronze Pollie in the category of Best Use of Social Pressure-Public Affairs for an online ad he created for The Cherokee People Demand the Truth from Elizabeth Warren, a group formed following that Massachusetts Democrat’s claim to Cherokee heritage. “Being of Cherokee descent myself, helping push back against Professor Warren was important,” Travis said. The Pollie Awards are awarded annually by the professional association. Submissions are judged by a “blind” panel of the consultant’s peers. The Pollies are the premier award for political advertising and consulting. 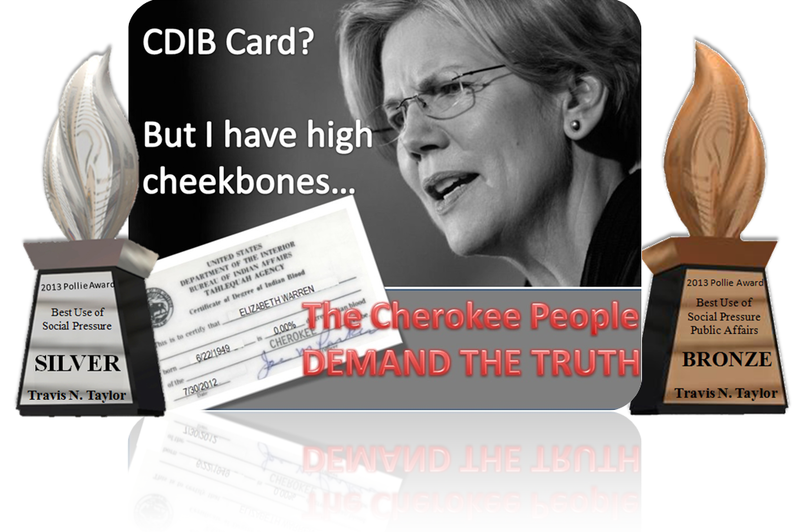 Travis’ submission highlighted Warren’s claim that her grandmother’s “high cheek bones” were proof of her Cherokee heritage while pointing out that Warren was never able to provide documents validating her claim. His 2013 Pollie Awards are Travis’ firsts and was his first entry into the competition. He has been a political consultant for three years. Travis recently completed another training at the Leadership Institute in Arlington, VA. In an effort to expand his skill set, Travis attended LI’s Comprehensive Fundraising School, which included instruction from leading fundraising experts in conservative politics on topics such as fundraising events, online fundraising, and using direct mail to raise funds. Leadership Institute is the premier training organization in the United States for conservative politics. LI has trained more than 100,000 conservative leaders since 1979. “I’m a proud LI graduate because I’m committed to the success of my clients,” Travis said. © 2012-2018 by Travis N. Taylor.